Rio Conchos 1964 Dir. 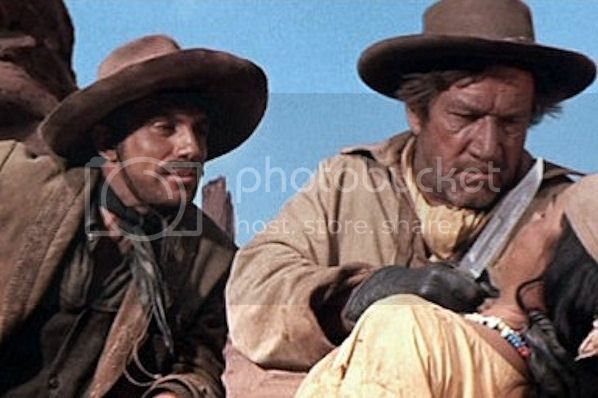 Gordon Douglas, with Richard Boone, Stuart Whitman, Anthony Franciosa, Wende Wagner, Rodolfo Acosta, and Jim Brown in his first film role. 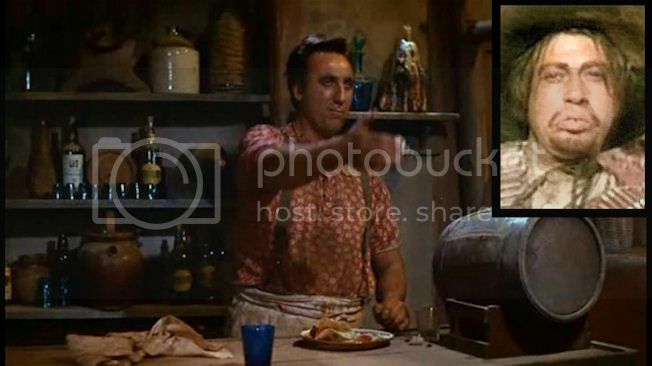 Supportig cast includes character actor Vitto Scotti in a humorous turn as a Mexican bandit with a very bad overbite, perennial nut job Timothy Carey as Cantina Owner "Chico", and Edmund O'Brien as the demented Col. Theron 'Gray Fox' Pardee. Writers were Joseph Landon (screenplay), Clair Huffaker (screenplay) from Clair Huffaker's novel. 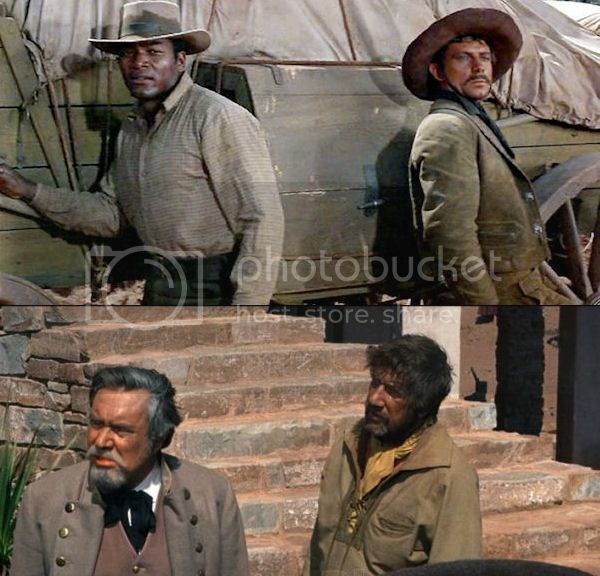 Its sort of a reworking of The Comancheros from Paul Wellman's novel of which Huffaker also has a screenplay credit. It is interesting to speculate if Huffaker wanted to improve upon Wellman's basic story line with Rio Conchos. I think she did so amazingly, working in a reference to Gen. Joe Shelby and approximately 1,000 of his remaining troops who rode south into Mexico rather than surrender, immortalized as "the undefeated". Spectacular cinematography of the landscapes of Arizona, and, Moab, Utah, by the legendary Joe MacDonald (Pickup on South Street, Niagara, Viva Zapata!, Panic in the Streets, Yellow Sky, The Street with No Name, Call Northside 777, My Darling Clementine) complimented with a catchy score by Jerry Goldsmith should elevate this film into a list of the best American Westerns. Finally picked up the Shout DVD a Jim Brown set with this film doubled with Take a Hard Ride at an FYE. So gave it a play yesterday. Gordon Douglas (veteran director of Our Gang/Little Rascals shorts, Noirs - Walk A Crooked Mile, Between Midnight and Dawn, Kiss Tomorrow Goodbye, I Was a Communist for the FBI, and Westerns, Maverick (TV), Clint Walker vehicles, Fort Dobbs Gold of the Seven Saints and Yellowstone Kelly) made a great Western with Rio Conchos. Starts off with a bang literally, we here an incessant wind before we see an Apache Indian burial party that is performing its ceremony upon a high mesa. We watch them carrying a body to the burial grounds, then they place the body down and begin to place rocks around it. In the bg. 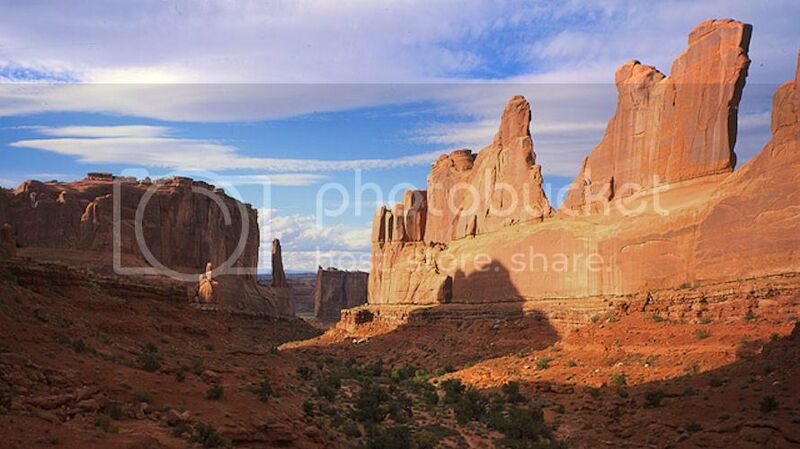 we see silhouetted against a high desert landscape a rider dismount and grab his Winchester. The man then blasts every Apache dead then rides off. We next see a troop of cavalry approach a burned out ranch and Catpain Haven (Whitman) and Sergeant Franklyn (Brown) enter the house to find a belligerent drunken ex Major James Lassiter (Boone). 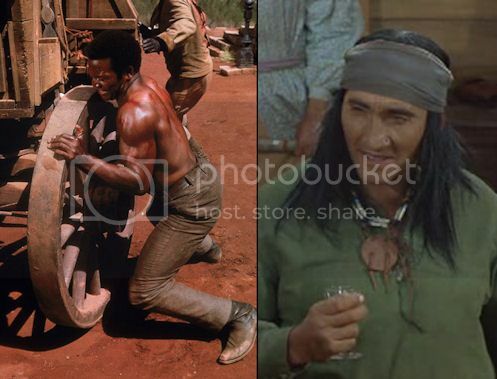 Lassiter is on a personal vengeance mission against all Apaches and especially Apache Chief Boodshirt's (Rodolfo Acosta) band. They (US Cavalry) know he shot down the burial party but they are more interested in where he got the "Yellowboy" Winchester, which was from a stolen shipment sent Southwest from St. Louis that was to supply the army outposts. Richard Boone as Major James Lassiter in his burned out hacienda. Lassiter an ex Confederate Major tells them to go to hell so they arrest him and take him back to the fort. He's thrown into the jail with Mexican bandit Rodriguez (Franciosa). Eventually he makes a deal to lead Haven to Col. Pardee ( in a great cameo by Edmund O'Brien) a renegade Confederate who is trying to build a new South on the Rio Conchos complete with a half built false front Southern mansion "Riverview" that is very surrealistic. A similar scenario as "The Comancheros" but I like this film better. And it has a great ending, worth checking out. The bulk of the film is the tail journey and the groups travails to reach Pardee, their bait is a wagon load of gunpowder. They must avoid Apaches, Mexican bandits, and a band of Texas Rangers who guard the border crossing at Presidio, Texas. The film has a number of nice set pieces. Clockwise from top left, Brown, Franciosa, Boone, O'Brien. Its only flaws are Wende Wagner who really hasn't much to do, and the use of SAA Colt Peacemakers six years too soon. Richard Boone is great in this, again he plays a tough hombre to the hilt who seeks vengeance. Tony Franciosa is a believable half breed, O'Brien has a wonderful cameo along with Carey, Scotti is a hoot as a Mexican, and Jim Brown in his debut is fine. An interesting dynamic that plays out is Lassiter's hatred of the Apache against his old Loyalties to the South, when he finds out that Pardee's plan is to, in part, arm the Apache and let them loose upon the US as sort of auxiliary troops, he knows he's crazy. 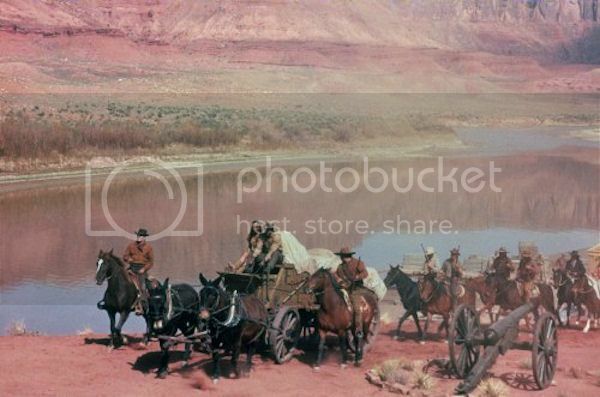 The arrival of the powder wagon to Pardee's camp "Riveriew"
One of those titles I always missed, it was hard to catch in the 80s and 90s. to see CONCHOS. No disappointment at all. Must look great on the big screen! 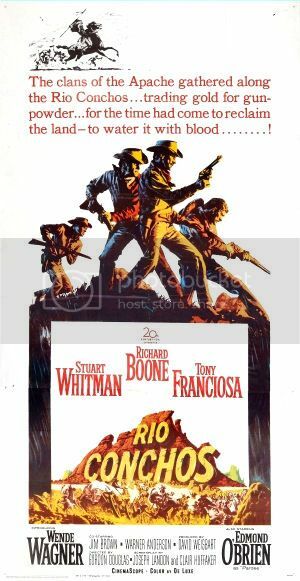 Rio Conchos is presented on Blu-ray courtesy of Timeless Media Group with an AVC encoded 1080p transfer in 2.35:1. Perhaps because of this being a CinemaScope feature, this is probably overall the nicest looking high definition presentation of the four included on this Blu-ray disc. The elements are in remarkably good shape overall, with only very minor damage to report. 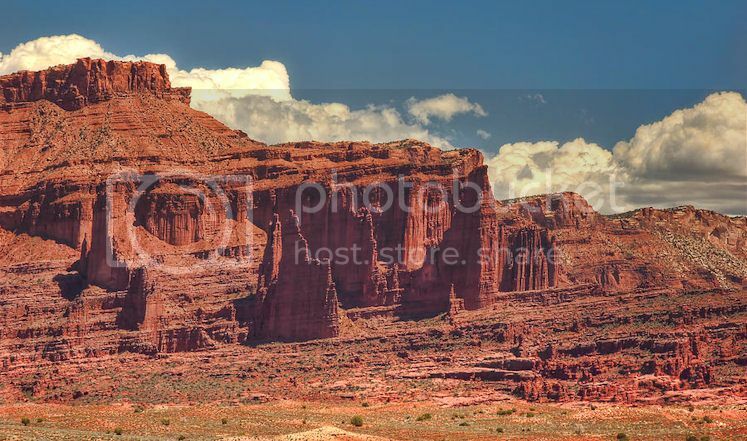 In fact by far the most distracting things that crop up are the almost comically large reel change markers, which suddenly appear in the Utah sky like flying saucers in a 1964 version of Cowboys & Aliens. Colors seem to have faded just slightly toward the brown side of things, but it's extremely slight. Generally speaking the image is beautifully sharp and well detailed, though it appears dupes or some other secondary elements were used for some establishing shots (you'll notice some extremely fuzzy moments when Pardee's camp is reached). just watched it on a curved screen no less! Tough grizzled Oater worthy of re-evaluation. Rio Conchos is directed by Gordon Douglas and adapted to screenplay by Joseph Landon from the Clair Huffaker novel. It stars Richard Boone, Stuart Whitman, Jim Brown, Tony Franciosa, Wende Wagner and Edmond O'Brien. Music is scored by Jerry Goldsmith and Joseph MacDonald is the cinematographer. 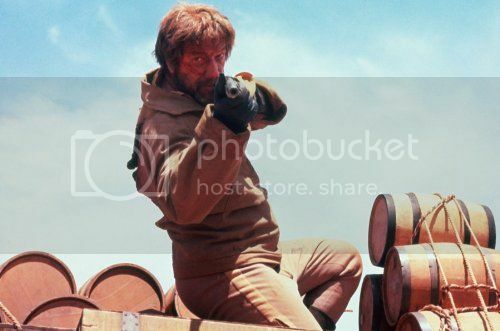 Out of 20th Century Fox it's a CinemaScope production filmed in De Luxe Color, and primary location used for filming was Moab, Utah. One ex-Confederate officer out for revenge against the Apache, one Army Captain driven by a sense of duty, one Buffalo Soldier continuing to prove himself and one Mexican convict getting a second shot at freedom. 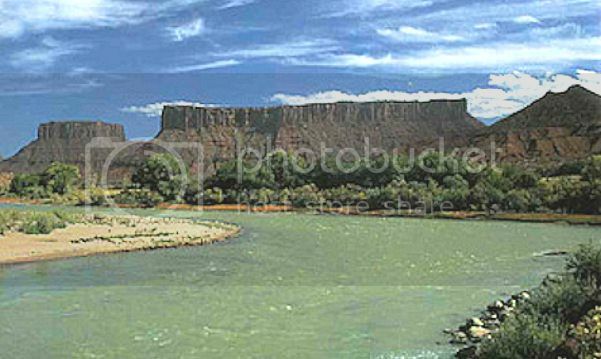 Four men, one journey, a mission to find who is arming the Apache with repeating rifles. Danger, mistrust and hostility are their only companions. The plot may be routine, and certainly it owes a debt to The Comancheros (Huffaker involved there too), but this is a tough and dark Western propelled by fine acting, quality direction and photography to die for. Structured around a men on a mission basis, each one with their own particular issues, it's very much a character driven piece. It's the time spent in the company of these men that makes the film so riveting, it never gets dull, the character dynamics are such, that we never quite know what to expect from the next part of the journey. Director Douglas also doesn't shy from action, pitting our odd group against Mexican Bandits and Apache Indians along the way, and then delivering a high octane finale that has a few twists and turns to keep it away from being formulaic. Whitman and Brown acquit themselves well enough, as does Wagner as the sole female of the piece. But acting wise this film belongs to Boone and Franciosa. The former portrays a bitter vengeful heart with ease, with a lived in alcoholic face, his destiny you feel is mapped out from the off. The latter shines as the ebullient character of the group, shifty, sly and as untrustworthy as it gets, Franciosa's play off of Boone gives the film its central pulse beat. But arguably all players are trumped by MacDonald's photography and Douglas' use of the scenery. From pretty much the first frame the landscape is the big character here. Douglas wisely using many long shots to reveal miles of vistas, then knowing when to pull in close to envelope the characters to give off the feeling of mental claustrophobia. Exterior work here belies the budget afforded the film, and all told it's a far better movie than the bigger produced Comancheros. Goldsmith's score is also a plus point, striking the mood from the get go, his arrangements flow at one with the hazardous destiny of the four men. A funny detail is that the screenplay has nearly nothing to do with the novel, albeit it being officially an adaptation of Huffaker's own novel.